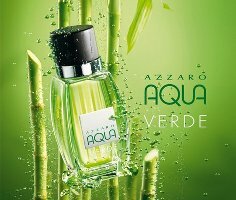 Azzaro will follow last year's Azzaro Aqua with Aqua Verde, a new limited edition summer fragrance for men. Aqua Verde is a sparkling aromatic scent with notes of galbanum, lavender, nutmeg, cedar and vetiver. Notes sound nice and it’s interesting that there is no citrus listed. I’ve been trying out more “men” fragrances and this sounds nice. I do like the original. It’s interesting that no citrus is listed and is that bamboo in the image? But chances are there’s citrus in the scent. And yes, bamboo! I like the sound of the notes, too. All favorites of mine unless the cedar dominates too much, which is unlikely in a summer fragrance (I would hope!). Who has tried the Azzaro Aqua? This sounds great but lavender has never been my friend. The ad/bottle look fantastic, though. If I see this around…. Macy’s carried the Azzaro Aqua last summer, & assume they’ll get this one but not positive. I work at Macy’s and I did not see this on the new releases that we were to receive. It sounds really good actually, I just hope its STRONG. I like the original, and this sounds really good, for both men and women. I really like lavender in scents, Cedar and vetiver sound really good too!